"Johnson" is one of the most popular last names in America. In fact, more than 1.8 million people claimed the surname in the 2000 United States Census, giving it pride of place as the second most common last name in the country. It's fun to learn about the origin and history of this popular name. Like many surnames, Johnson is patronymic. This means that it is based on the first name of the father: "John's son." Surname Database reports that the first written record of the surname was in 1287 on a document called, Descriptive Catalog of Ancient Deeds. In this case, it was spelled "Jonesson." Johnsons have been in the New World as long as many of the other old families. Englishman Isaac Johnson and his wife Arabella settled near Boston in 1630. Johnson was one of the wealthiest and most powerful men in the area, but both he and his wife died the same year they immigrated. However, another Johnson arrived well before Isaac and Arabella. This was Anthony Johnson, an African American man who landed in Virginia in 1621. He was either a slave or an indentured servant, according to PBS. Anthony and his wife, Mary, eventually bought their freedom and went on to own 250 acres of property. According to Ancestry.com, the majority of Johnsons originally hailed from Sweden, although there were also many who emigrated from Great Britain. A smaller portion came from Norway, Germany, and Ireland. These settlers arrived from the 1600s through the 1800s, and there was a surge in immigration in the 1880s. This coincides with a trend in Swedish immigration as reported by Augustana College; the 1880s were the largest decade of Swedish immigration. Many Johnsons settled in New York, Minnesota, Texas, Illinois, Pennsylvania, and Georgia with each of these states boasting between 10,000 and 20,000 Johnson family members in the 1920 census. Ancestry's Canadian site also reports that most Johnsons in Canada originally came from Sweden and England. 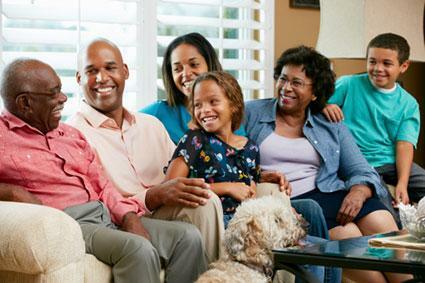 If you are a member of the Johnson family, the Internet makes it easy to perform detailed genealogy research on your branch. Simply start with what you know and create your family tree from there. The following resources can help you learn more about your history. House of Names - This site offers a history of the Johnson family, as well as a picture of the coat of arms. You can buy a printed image of the family crest as well as a number of other Johnson products. Eltiste-Kaiser Johnson Family Site - This resource has a free image of the Johnson coat of arms in addition to a listing of many famous Johnson family members. The site reports that the family motto is "Never unprepared." The Tree Maker - While most sites feature only the English version of the Johnson family crest, this one sells versions from all over the world. You must purchase the image, but this is a good place to look if your branch hails from anywhere besides England. The Johnson Genealogy and Family Tree Page - This is an excellent resource with links for biographical sketches of famous Johnsons, trees for many Johnson families, early genealogy books, and even DNA results. Johnsons on Rootsweb - This listing of Johnson family sites on the wonderful free website, Rootsweb, is an amazing resource for finding out about the different branches of the surname. Remember that family sites display varying levels of quality when it comes to research, so it's important to double-check any information you find. Johnson Family Tree Circles - This site includes listings for Johnson genealogy information around the world, including many families from Australia and New Zealand. This is a good resource if you need information about Johnsons outside of North America. Whether you are looking for your family crest or want to know the details about your surname's country of origin, there's a lot to learn about the Johnson family. Understanding the migration and history of this popular surname can help you give context to the names and dates on your family tree.